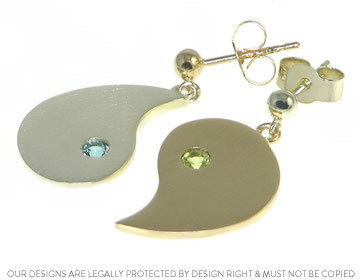 Unique handmade 9 carat white and yellow gold certificated Fairtrade and Fairmined earrings. As a pair the earrings connect to form the iconic and recognisable shaping of the Fairtrade logo. The set features two invisibly set stones, on one earring is a 2.5mm 0.09 carat brilliant cut topaz and on the other is a 2.5mm 0.10 carat brilliant cut peridot.